Leitrim 0-9 Mayo 0-8 (Páirc Sheáin Uí Eislin, Ballinamore, 13/1/2013). MAYO: Kenneth O’Malley; Michael Walsh, Shane McHale, Keith Rogers; Tom Cunniffe, Lee Keegan (0-1), Richie Feeney; Jason Gibbons, Seamus O’Shea; Conor O’Shea, Enda Varley (0-1, free), Cathal Carolan; Darren Coen (0-2), Alan Freeman (0-2, frees), Michael Conroy (0-1). Subs: Barry Moran (0-1) for Gibbons (inj. ), Colm Boyle for Conor O’Shea, Ger Cafferkey for McHale. Mayo 2-14 GMIT 0-6 (Flanagan Park, Ballinrobe, 16/1/2013). MAYO: David Clarke; Michael Walsh, Cathal Hallinan, Keith Rogers; Tom Cunniffe, Donal Vaughan, Chris Barrett (0-1); Jason Gibbons, Barry Moran; Lee Keegan (0-3), Richie Feeney (1-1), Cathal Carolan; Conor O’Shea (1-1), Alan Freeman (0-7, two frees, one ’45), Michael Conroy. Subs: Brendan Harrison for Cunniffe, Keith Higgins for Barrett, James Shaughnessy (0-1) for Conroy, Darren Coen for Feeney, Mark Duffy for Clarke. Mayo 0-10 Roscommon 1-7 (Ballyhaunis, 20/1/2013). MAYO: David Clarke; Ger Cafferkey, Shane McHale, Keith Rogers; Keith Higgins (0-1), Donal Vaughan (0-1), Colm Boyle; Aidan O’Shea (0-2), Seamus O’Shea (0-2); Kevin McLoughlin, Richie Feeney, Lee Keegan; Alan Murphy (0-3, frees), Alan Freeman, Jason Doherty (0-1). Subs: Chris Barrett for McHale, Barry Moran for Seamus O’Shea, Brian Gallagher for Keegan, Michael Conroy for Doherty, Tom Cunniffe for Cafferkey. Mayo 0-15 Kerry 1-6 (MacHale Park, 3/2/2013). MAYO: David Clarke; Shane McHale, Ger Cafferkey, Keith Higgins; Tom Cunniffe, Colm Boyle, Chris Barrett; Aidan O’Shea, Seamus O’Shea; Lee Keegan, Richie Feeney (0-1), Cathal Freeman; Kevin McLoughlin (0-3, two frees), Jason Doherty (0-6, five frees), Michael Conroy (0-3). Subs: Alan Freeman for Cathal Freeman, Barry Moran for Seamus O’Shea, Jason Gibbons for Aidan O’Shea (blood sub), Enda Varley (0-2) for Feeney. Mayo 1-11 Tyrone 1-12 (MacHale Park, 10/2/2013). MAYO: David Clarke; Kevin Keane, Ger Cafferkey, Keith Higgins (1-0); Tom Cunniffe, Colm Boyle, Chris Barrett; Aidan O’Shea, Seamus O’Shea; Lee Keegan (0-1), Richie Feeney, Cathal Freeman; Kevin McLoughlin (0-3, frees), Jason Doherty (0-6, five frees), Michael Conroy. Subs: Barry Moran for Seamus O’Shea, Enda Varley for Barrett, Alan Dillon for Freeman, Donal Vaughan (0-1) for Boyle. Dublin 2-14 Mayo 0-16 (Croke Park, 2/3/2013). MAYO: Kenneth O’Malley; Chris Barrett, Ger Cafferkey, Keith Higgins; Lee Keegan (0-3), Donal Vaughan, Colm Boyle; Jason Gibbons, Barry Moran; Kevin McLoughlin (0-3, two frees), Aidan O’Shea (0-1), Richie Feeney; Enda Varley (0-2), Jason Doherty (0-6, three frees), Michael Conroy (0-1). Subs: Cathal Carolan for Gibbons, Seamus O’Shea for Moran, Tom Cunniffe for Feeney. Down 0-13 Mayo 0-11 (Páirc Esler, Newry, 9/3/2013). MAYO: Kenneth O’Malley (0-1, a ’45); Chris Barrett, Ger Cafferkey, Keith Higgins; Lee Keegan, Donal Vaughan, Colm Boyle; Barry Moran (0-1), Aidan O’Shea; Kevin McLoughlin (0-1, free), Richie Feeney, Cathal Carolan (0-3); Enda Varley, Jason Doherty (0-4, three frees), Michael Conroy (0-1). Subs: Kevin Keane for Cafferkey (inj. ), Tom Cunniffe for Feeney, Alan Freeman for Vaughan, Evan Regan for Varley. Mayo 0-13 Kildare 1-11 (MacHale Park, 16/3/2013). MAYO: David Clarke; Chris Barrett, Ger Cafferkey, Keith Higgins; Lee Keegan, Tom Cunniffe (0-1), Colm Boyle (0-2); Barry Moran, Seamus O’Shea; Kevin McLoughlin (0-1, free), Aidan O’Shea, Cathal Carolan (0-2); Evan Regan (0-3, two frees), Jason Doherty (0-2, one a free), Michael Conroy. Subs: Cillian O’Connor (0-2, frees) for Regan, Richie Feeney for Carolan, Enda Varley for Conroy, Jason Gibbons for Aidan O’Shea. Mayo 1-10 Donegal 0-9 (MacHale Park, 24/3/2013). MAYO: David Clarke; Chris Barrett, Ger Cafferkey, Keith Higgins; Lee Keegan, Tom Cunniffe, Colm Boyle (0-1); Barry Moran, Seamus O’Shea; Kevin McLoughlin (0-2, one free), Aidan O’Shea, Cathal Carolan; Cillian O’Connor (0-5, four frees), Jason Doherty, Michael Conroy (1-0). Subs: Richie Feeney for O’Connor, Donal Vaughan for Higgins, Brian Gallagher for Seamus O’Shea, Enda Varley (0-2) for Conroy, Alan Freeman for Carolan. Cork 0-10 Mayo 0-11 (Páirc Uí Chaoimh, 7/4/2013). Mayo: David Clarke; Kevin Keane, Ger Cafferkey, Shane McHale; Lee Keegan, Donal Vaughan (0-1), Colm Boyle; Jason Gibbons, Seamus O’Shea; Kevin McLoughlin (0-4, two frees), Aidan O’Shea (0-1), Cathal Carolan; Cillian O’Connor (0-3, frees), Alan Freeman (0-1), Michael Conroy (0-1). Subs: Enda Varley for Conroy, Richie Feeney for Carolan, Darren Coen (blood) for Varley, Chris Barrett for McHale, Jason Doherty for Freeman, Evan Regan for O’Connor. SEMI-FINAL: Dublin 2-16 Mayo 0-16 (Croke Park, 14/4/2013). Mayo: David Clarke; Kevin Keane, Ger Cafferkey, Chris Barrett; Lee Keegan, Donal Vaughan, Colm Boyle; Jason Gibbons (0-1), Seamus O’Shea; Kevin McLoughlin (0-1, a free), Aidan O’Shea (0-2), Cathal Carolan (0-1); Cillian O’Connor (0-8, seven frees); Jason Doherty, Michael Conroy (0-3). Subs: Richie Feeney for Doherty, Brian Gallagher for Gibbons, Michael Walsh for Keane, Alan Murphy for Carolan, Evan Regan for McLoughlin. QUARTER-FINAL: Galway 0-11 Mayo 4-16 (Pearse Stadium, 19/5/2013). MAYO: David Clarke; Tom Cunniffe, Ger Cafferkey, Keith Higgins; Lee Keegan (0-1), Donal Vaughan (1-1), Colm Boyle; Aidan O’Shea, Seamus O’Shea; Kevin McLoughlin, Cillian O’Connor (0-6, four frees), Cathal Carolan (1-0); Enda Varley (1-3), Alan Freeman (0-1), Alan Dillon (0-2). Subs: Shane McHale for Cafferkey, Darren Coen (0-1) for Dillon, Richie Feeney (0-1) for Freeman, James Burke for Keegan, Andy Moran (1-0) for Carolan, Jason Gibbons (blood) for Aidan O’Shea. SEMI-FINAL: Mayo 0-21 Roscommon 0-9 (MacHale Park, 16/6/2013). MAYO: David Clarke; Tom Cunniffe, Ger Cafferkey, Keith Higgins (0-1); Lee Keegan (0-1), Donal Vaughan (0-1), Colm Boyle (0-2); Aidan O’Shea (0-1), Seamus O’Shea; Kevin McLoughlin (0-5, four frees), Richie Feeney (0-1), Cathal Carolan; Enda Varley (0-1), Alan Freeman (0-4, three frees), Alan Dillon (0-1). Subs: Kenneth O’Malley for Clarke, Andy Moran (0-1) for Carolan, Darren Coen (0-2) for Varley, Shane McHale for Cafferkey, Kevin Keane for Higgins. FINAL: Mayo 5-11 London 0-10 (MacHale Park, 21/7/2013). MAYO: Rob Hennelly; Tom Cunniffe, Ger Cafferkey, Chris Barrett; Lee Keegan (0-2), Keith Higgins, Colm Boyle; Aidan O’Shea, Seamus O’Shea; Kevin McLoughlin (0-2, one free), Alan Dillon, Richie Feeney (0-1); Andy Moran (0-1), Alan Freeman (1-2), Darren Coen (1-0). Subs: Cillian O’Connor (3-3, penalty goal and two frees) for Coen, Michael Conroy for Freeman, Donal Vaughan for Feeney, Shane McHale for Cafferkey, Enda Varley for Moran. QUARTER-FINAL: Mayo 4-17 Donegal 1-10 (Croke Park, 4/8/2013). MAYO: Rob Hennelly; Tom Cunniffe, Ger Cafferkey, Chris Barrett (0-1); Lee Keegan (0-1), Donal Vaughan (1-0), Colm Boyle (0-1); Aidan O’Shea, Seamus O’Shea (0-1); Kevin McLoughlin (0-1), Keith Higgins, Alan Dillon (0-2); Cillian O’Connor (3-4, two frees, one ’45), Alan Freeman (0-2), Andy Moran (0-1). Subs: Cathal Carolan for Cunniffe, Richie Feeney (0-1) for Dillon, Enda Varley (0-1) for Moran, Darren Coen for O’Connor, Kevin Keane (0-1) for Boyle. SEMI-FINAL: Mayo 1-16 Tyrone 0-13 (Croke Park, 25/8/2013). MAYO: Rob Hennelly (0-1, free); Tom Cunniffe, Ger Cafferkey, Chris Barrett (0-2); Lee Keegan (0-2), Donal Vaughan, Colm Boyle; Aidan O’Shea (0-1), Seamus O’Shea; Kevin McLoughlin (0-1, free), Keith Higgins, Alan Dillon (0-2); Cillian O’Connor (0-1, free), Alan Freeman (1-4, penalty goal and three frees), Andy Moran. Subs: Enda Varley (0-1) for O’Connor, Michael Conroy for Andy Moran, Cathal Carolan (0-1) for Cunniffe, Richie Feeney for Vaughan, Barry Moran for Aidan O’Shea. FINAL: Dublin 2-12 Mayo 1-14 (Croke Park, 22/9/2013). MAYO: Robbie Hennelly; Tom Cunniffe, Ger Cafferkey, Chris Barrett; Lee Keegan (0-2), Donal Vaughan, Colm Boyle; Aidan O’Shea, Seamus O’Shea (0-1); Kevin McLoughlin, Keith Higgins (0-1), Alan Dillon; Cillian O’Connor (0-8, frees), Alan Freeman, Andy Moran (1-2). Subs: Michael Conroy for Freeman, Cathal Carolan for Cunniffe, Enda Varley for Dillon, Barry Moran for Seamus O’Shea, Jason Doherty for Andy Moran. SEMI-FINAL: Galway 0-9 Mayo 0-7 (Tuam Stadium, 23/3/2013). 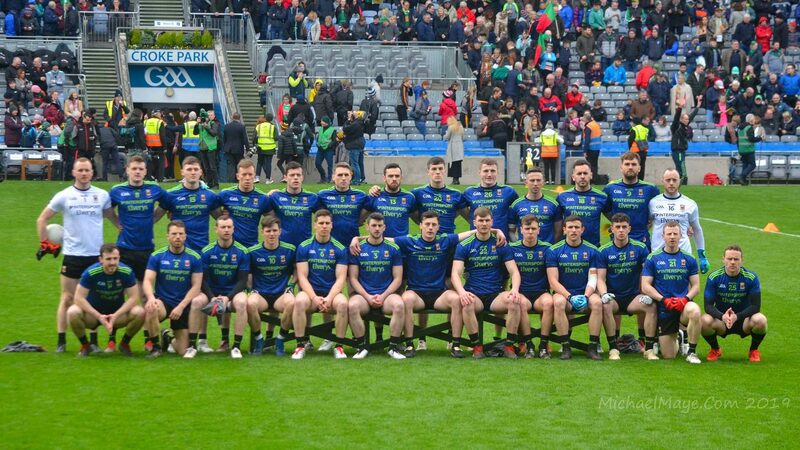 MAYO: Paul Mannion; Brendan Harrison, Niall Freeman, Aidan Butler; Conor Horan, Conor Walsh, Eoghan Collins; Danny Kirby (0-1), Mícheál Forde; Adam Gallagher, Evan Regan (0-2, frees), Fergal Durkan; Darren Coen, Conor O’Shea, Cillian O’Connor (0-4, three frees). Subs: James Shaughnessy for Gallagher, Eoin Jordan for Durkan, Eoghan Lavin for Coen, Keith Rutledge for Regan. PRELIMINARY ROUND: Mayo 1-15 Leitrim 1-5 (MacHale Park, 22/6/2013). MAYO: Marc Mulligan; Eddie Doran, Seamus Cunniffe, David Kenny; Ronan Finn, Stephen Coen (0-1), Michael Hall (0-1); Val Roughneen (0-2), Diarmuid O’Connor (0-1); Brian Walsh, Conor Loftus, Cian Hanley; Tommy Conroy (1-0), Liam Irwin (0-5, three frees); Darragh Doherty (0-2). Subs: Stephen Burke for Loftus, Conor Byrne (0-3) for Conroy, Padraig Prendergast for Doherty, Sean Conlon for Finn. SEMI-FINAL: Mayo 5-8 Galway 2-11 (after extra-time) (Hyde Park, 30/6/2013). MAYO: Marc Mulligan; Eddie Doran, Seamus Cunniffe, David Kenny; Ronan Finn, Stephen Coen, Michael Hall; Val Roughneen, Diarmuid O’Connor; Brian Walsh, Conor Loftus (1-1), Cian Hanley (1-0); Tommy Conroy (2-2), Liam Irwin (0-5, frees), Darragh Doherty (1-0). Subs used: Sean Conlon for Finn (inj); Stephen Burke for Walsh; Michael Plunkett for Hanley; Conor Byrne for Doherty. FINAL: Mayo 3-7 Roscommon 1-10 (MacHale Park, 21/7/2013): MAYO: Marc Mulligan; Eddie Doran, Sean Conlon, David Kenny; Ronan Finn, Stephen Coen (0-1), Michael Hall; Val Roughneen (0-1, a free), Diarmuid O’Connor; Conor Loftus (1-0), Stephen Burke (0-1), Cian Hanley; Darragh Doherty (1-0), Liam Irwin (1-3, two frees), Tommy Conroy (0-1). Subs: Conor Byrne for Doherty, Michael Plunkett for Roughneen. QUARTER-FINAL Mayo 2-13 Westmeath 0-8 (O’Connor Park, Tullamore, 5/8/2013). MAYO: Mark Mulligan; Eddie Doran, David Kenny, Michael Hall; Ronan Finn, Stephen Coen, Sean Conlon; Val Roughneen (0-1, free), Diarmuid O’Connor; Conor Loftus (0-2), Michael Plunkett (0-2), Cian Hanley (1-2, penalty goal); Darragh Doherty (1-1), Liam Irwin (0-3, frees), Tommy Conroy (0-2). Subs: Conor Byrne for Doherty, Padraig Prendergast for Hanley, Hugh Cafferty for Conlon, Brian Walsh for Plunkett, Kevin Jordan for Finn. SEMI-FINAL: Mayo 3-19 Monaghan 1-12 (Croke Park, 25/8/2013). MAYO: Mark Mulligan; Eddie Doran, Seamus Cunniffe, David Kenny; Michael Hall (0-2), Stephen Coen (0-2), Sean Conlon; Val Roughneen, Diarmuid O’Connor; Conor Loftus (1-1), Michael Plunkett (1-2), Cian Hanley; Darragh Doherty (0-4), Liam Irwin (0-3, two frees), Tommy Conroy (1-2). Subs: Padraig Prendergast for Hanley, Conor Byrne (0-1) for Doherty, Ronan Finn for Doran, James Langan for Plunkett, Fionan Duffy for Irwin. FINAL: Mayo 2-13 Tyrone 1-13 (Croke Park, 22/9/2013) MAYO: Mark Mulligan; Eddie Doran, Seamus Cunniffe, David Kenny; Michael Hall, Stephen Coen, Sean Conlon; Val Roughneen, Diarmuid O’Connor; Conor Loftus (0-3, one free), Michael Plunkett, Padraig Prendergast; Darragh Doherty (1-2), Liam Irwin (0-4, frees), Tommy Conroy (1-3). Subs: Conor Byrne (0-1) for Doherty, Hugh Cafferty for Plunkett.